Good morning! Only 4 days left until Christmas Eve! As we get closer and closer to Christmas Eve, we start really believing in different things. We might believe that this year will be better….that the 24th will make a difference…that human beings can reach out in kindness and love. We might believe that the food will taste better and we will sleep well. We might believe that our dear friend will heal or our mourning will lighten. We might believe that singing can change the world and prayers will be heard. We believe that it is good to be home or to receive those returning to us. Our scriptures this morning are statements of belief…that God will bless Elizabeth with a child and the people of Israel will see God, for example. When you read them, if you do, read them as statements of belief and see if that changes anything. In addition check this out…. One of my favorite sites to visit is http://thisibelieve.org I check out what others believe in their essays every once in a while. One of my all time essays comes from a kiddo. You can listen to it here and read it below. Take it in and add to the list if you are so moved. I believe that we will spend this season preparing our hearts for something grand in the future. I believe that the world continues to transform and change. I believe God is still in it. When Tarak McLain’s kindergarten group celebrated their 100th day of class, some kids brought 100 nuts or cotton balls. Tarak brought a list of 100 things he believes. Now a first-grader, Tarak shares his top beliefs about God, life, nature and war. I believe life is good. I believe God is in everything. .I believe everyone is weird in their own way. I believe hate is a cause for love. I believe that when I meditate I feel peaceful. .I believe brothers and sisters should be kind to each other. I believe kids should respect their parents. I believe I should not whine. I believe people should wake up early. I believe people should go outside more. I believe people should use less trees. I believe we should help the Arctic and rainforest animals. I believe people shouldn’t throw litter on the ground. I believe people should not smoke. I believe people should not give up. I believe love is everywhere. I believe that God helps us to have a good time. I believe we live best in a community. I believe we can protect people in danger. I believe we should help the poor. I believe its OK to die but not to kill. I believe war should not have started. I believe war should stop. I believe we can make peace. 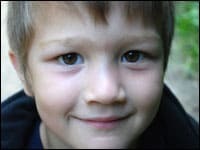 Seven-year old Tarak McLain was born in Thailand and lives with his family in Austin, Texas. He collects and hands out food to the homeless, raises money for orphans and impoverished schools, reads about the world`s religions and listens to public radio.